A simple lemony shortbread crust with a tart, refreshing lemon custard, these gluten free lemon bars are so easy to make. Perfect for any occasion, from potlucks to bake sales. Smooth, creamy and tart classic gluten free lemon bars seem to be beloved by nearly everyone. If you don’t love them, or anything lemon flavored, then this recipe is not going to be for you. But if you’re a lemon lover (and if you are, then you have to try our lemon pound cake and our lemon meltaway cookies), you are going to love these bars. The crust is the perfect blend of chewy and crunchy, and the custard is lemony cool and fresh. All this is to say … there is really just no excuse for using bottled lemon juice. I’ll never be able to grow my own lemons, but I’ll bake with them forever and ever because lemon-flavored things are almost as universally loved as chocolate-flavored things. I vow never to use bottled lemon juice in baking (or otherwise for that matter). Baking and cooking mean applying heat, and heat intensifies flavors. If the flavor isn’t great at the start, just wait until you bake with it. If you’ve ever had lemon curd, which is similar to a lemon pudding or custard, this filling will taste similar. Unlike lemon curd, though, the filling in these bars is baked, not cooked. It will be firm enough to bite into once it’s set in the refrigerator. To make these bars, you will have to place the pan in the oven twice. I promise it’s not a big deal, though. The crust is a relatively sticky dough that’s made with gluten free flour, confectioners’ sugar (to keep it light), lemon zest, salt, and melted butter. Just press it into the pan with an offset spatula (or even just a spoon) and bake it just until it’s set. There’s no leavening in the crust, so it won’t rise very much at all. Baking it alone prevents it from getting soggy when you add the filling. As the crust is cooling, make the filling by whisking eggs, granulated sugar, baking powder and lemon juice. Pour the filling right on top of the blind-baked crust and pop it back in the oven to bake until the filling barely jiggles when it’s shaken from side to side. As the filling is baking, if you peek in the oven (not advisable, but if you can’t help it) before the last 7 or 8 minutes, you’ll think that the bars will never actually set. It will seem almost like a liquid for most of the baking time. As long as you haven’t changed the recipe and your oven is at the proper temperature, it will set. Dairy-free: The only source of dairy in these bars is the butter in the crust. That’s good news if you’re dairy-free. The crust should still turn out if you replace the butter with half Earth Balance buttery sticks and half Spectrum brand nonhydrogenated vegetable shortening. You can also use Melt Vegan Butter or Miyoko’s Kitchen Vegan Butter in place of the butter entirely. Watch the salt, though, since butter replacements tend to be quite salty (unlike shortening, which contains no salt). Egg-free: There are 4 eggs in this recipe. I’m afraid I don’t believe that you can replace all 4 of them with an egg substitute and achieve anything like the texture of these smooth, creamy custardy bars. So sorry! Sugar: The confectioners’ sugar should be able to be replaced with Swerve brand powdered sugar replacement. That tends to work quite well. You can try replacing the granulated sugar with Swerve brand granulated sugar substitute or Lankato monkfruit granulated sweetener. Sugar replacements tend to be drying, though, so you may have to add some moisture to the filling. Try another tablespoon of freshly squeezed lemon juice. Lemons: Since you’ve already promised to use freshly squeezed citrus in this recipe, we don’t have to revisit that point. If you’d prefer a lime-flavored bar, try my key lime pie bars. They’re similar in texture, and simply amazing. Gluten free flour blends: I do specify my gum-free gluten free flour blend for this recipe, which is made with a mix of mostly superfine white rice flour, with potato starch and tapioca flour/starch. There is no xanthan gum in this recipe. I’ve found that it makes for an almost chewy, gummy filling. It’s not nearly as important for the crust as it is for the filling. You do need a scale to make the blend, but if you must purchase a blend to use, I’d try using Cup4Cup. It contains xanthan gum, but much less and is a very light, starchy blend. Preheat your oven to 325°F. Grease an 8-inch square baking pan, line with criss-crossed pieces of parchment paper that overhang the sides, and grease the parchment paper. Set the pan aside. Make the crust. In a medium-sized bowl, combine 1 cup (140 g) of the flour, confectioners’ sugar, salt and lemon zest and whisk to combine, breaking up any clumps of lemon zest. Add the butter and mix with a fork until well-combined. Press the mixture into the bottom of the prepared baking dish in an even layer. Place the baking dish in the center of the preheated oven and bake for about 15 minutes or until firm. Remove from the oven and allow to cool briefly. Make the custard layer. In a medium-sized bowl, place the eggs, granulated sugar, baking powder, lemon juice and remaining 2/3 cup (93 g) flour, whisking vigorously to combine after each addition. Pour the custard mixture into the baked crust and return the pan to the center of the oven. Bake until just set (about 25 minutes). The custard is set when it does not jiggle more than a tiny bit in the center when the pan is shaken gently back and forth. Remove the pan from the oven and allow to cool in the pan for about 20 minutes. Place in the refrigerator to chill until firm, about 2 hours and up to overnight. Remove the bars from the pan by running a butter knife or thin spatula around the perimeter of the baking dish, and then lifting the bars out of the pan by the overhung pieces of parchment paper. Dust lightly with confectioners sugar, and slice into 9 or 12 squares with a large knife. Serve chilled. Recipe originally published in 2011, updated in 2015 and modified again (photos, video, text mostly new) in 2019. Those look so good!! I have always loved lemon bars, but after being diagnosed with Celiac, I figured I wouldn’t be able to have them anymore! Now I can!! Thanks! Have you ever frozen these? I need to bake some desserts for a Non Profit’s auction, and I will be out of town, so I need to make something that I can freeze. I was also thinking of making your Chocolate Caramel Shortbread. Hi, Cathy, I’ve refrigerated the bars, individually wrapped, for up to a week with no problem, but I haven’t frozen them. I’m really not sure how well they would fare in the freezer, I’m afraid. The filling is really a custard, and that typically doesn’t freeze particularly well. Sorry! You may be able to use VeganEgg in place of real eggs. VeganEgg can be made into scrambled eggs and omlets, or in baking. You have to follow the directions on the package for it to turn out right. I’ve heard of that, Charlaine, but I’ve never tried it. Glad you’ve had a good experience with it! Made for mom (a lemon lover) for her day some years ago. These are the BEST lemon bars EVAR. I don’t even like lemon. It is one of my go to recipes when I am entertaining because everyone loves them. Only dislike I have is a 9×13″ batch (double recipe) doesn’t last long enough. Why gun free flour? I only have Better Batter, what will it do? Did you use gluten free baking powder too ??? I have these in the oven right now. They smell amazing and can barely wait for them to chill. I shall be taking some in for the caretaker at work tomorrow as he’s such a sweetheart. I bet he won’t even guess they’re gluten free. I only have one big problem with your recipes – they are all soooo yummy that I’ve put on too much weight…! I made these last night. It was really hot in my kitchen, so maybe that interfered. The crust was really WET (like, greasy), and took forever to bake (and ithe was full of bubbles, like a pancake that’s ready to flip). I think I overbeat the custard, as it was kind of bubbly. All that said, I soldiered on, and it came out pretty well. Brought it into work today, and didn’t tell anyone it was GF. Hi, Lynn, I’m honestly not sure what could have caused those issues. It’s a very simple shortbread crust, one I’ve made dozens of times, so the first thing that comes to mind is always whether you made any substitutions, and/or whether you baked by weight. It sounds like your proportions were off! your lemon bars are one of our favorite recipes! we made the older version for Easter and EVERYBODY loved them. my little sister wants me to make the chocolate chip cookie cake for her 9th birthday in a couple days so that’s what we’re making next. our 10-year old daughter made these today all on her own with lemons from our tree and eggs from our chickens. She was diagnosed 2.5 years ago with a grain alllergy and it has been tough on her. She has discovered a love of GF baking. We live in South Africa, but are coming to USA to visit family at the end of the year, so i will be getting her your book for Christmas. Made some for the 4th. Put homemade strawberry syrup on top, so not too sweet. Amazon lost my potato starch, so had to sub cornstarch, but it worked, everyone raved over them. Non GF peeps could not tell the bars were gluten free. I just got your new Classic Snacks cookbook for my birthday (at my request!) and it’s AWESOME! These lemon bars remind me of my dad who loved lemon bars in my growing up years. I’m going to make some very soon.. in honor of my dad (and ME… as lemon is one of my favorites for desserts). If I baked everything that I love in your cookbooks (I have two now) I would be baking for at least five years! Marilyn, that is music to my ears (eyes?)!! Thank you so much for the kind words—and for your support in buying the cookbooks! My husband is diabetic. Can you substitute the granulated sugar for sucrolose? Thanks. How can I make this recipe with regular flour? I’m afraid I really don’t know, Chelsea. I recommend you find another recipe, as gluten free recipes really are different. Sorry! Would it work to double this and make in a 9×13? Or should I just do 2 smaller ones? Going to a block party and want to share this party with everyone! I think you could double everything and make it in a 9-inch x 13-inch pan, Victoria. You’ll just have to increase baking times. And make sure you don’t bake it in glass! :( Sad that I cannot partake in this lovely lemony gluten free goodness! How about a Paleo version? I know, Mare! A Paleo version is a good idea for the to-do list! Omg you’re killing me! Love! I LOVE lemon bars, and they sound like a refreshing treat during our grossly hot weather. Doubling the filling is a great idea, since the filling is the best part. Lemon season is over here (they are a winter thing) but limes are in season, so I think I will defrost some of my frozen lemon juice from last winter, and mix it with fresh lime juice for lemon-lime bars. Thank you! And I was unclear on the doubling the filling part. You mentioned that the reworked recipe makes more filling than the old one. I am going to make the recipe just as you wrote it- I just think that was a good change! Yesterday was my cranky day, as you could probably tell. Today is better, ordered some BB flour, baked your Cornmeal bread, just for me. Then I made semi-homemade Beans and Franks for my son. Remember I told you I would try anything. I hope this batch turns out better than the first, if not the dogs will have beans added to the regular meal AGAIN. I am not a big blog reader, I read exactly two. Have you on speed dial (RSS feed) on my front page. Do not change your style, ANY. So refreshing, informative, friendly, and to the point. p.s. I can count on 0 fingers how many ex-classmates I keep in touch with. So there, something in common. I’m so glad you’re feeling better. That cornmeal bread was a good choice as you wait for Better Batter to arrive, since it’s all cornmeal, no flour. Thank you for the kind words & encouragement. They really mean a lot to me. Hello. I live in Australia and have been a devotee of your wonderful recipes/gluten free deliciousness for a couple of months now. you mention the Better Batter flour mix you use a lot (we can’t get it down under) so what types of flour’s are used in this mix ? Thanks so much. Can’t wait to make the new lemon biscuits – so yum! Do drains in Australia really swirl counter-clockwise? Sorry. Dying to know. hahaha – yes, the drains in Australia do go ‘backwards’ apparently – tho it’s not backwards for us – only for you guys! thanks for the types of flours used in the Better Batter. I have used two we have readily available here but I find that esp one has potato flour as the top ingredient and it can have a weird taste. So I may just blend my own till I get a lovely taste and texture. Cheers and thanks again for your wonderful recipes and the very entertaining blog! I also live down under, I make my own flour from Nicole’s basic flour blend and use that for almost everything, works great. Finally got these made last night! Yum! Had them for breakfast, because I am that kind of mom. I’m so glad you’re caught up. :) I’m the kind of mom who would eat them for breakfast … when the children are done breakfast and out of smelling distance. And then deny it, so I didn’t have to give them any. Don’t tell them. Tune in tomorrow … brownie cheesecake bars. I am just seeing this post now and I’m so excited to try these! Made these for Father’s Day. Big hit! He loved them and I barely noticed the taste difference at all. Oh…my…gosh! Lemon bars are my favorite “cookie”! I love love love them. No lemons on hand, so I will be trying this later today with lime juice instead. Happy happy dance! I would love to hear how these turn out with lime juice. That sounds great to me — but my kids don’t really care for lime juice. They’re wrong of course, but what can you do? Thank you for your rant against the “rules”. I’m not a blogger, but I read a lot of them, and I love how you put your blog together. I actually have been thinking the same thing about the amount of navel-gazing that’s going on in the food blog world. I get completely turned off by the fake humility and cliqueish vibe a lot of the blogs give off. Not to mention that they use ingredients meant to impress people about how creative they are… and ingredients that are expensive on top of it. I appreciate so much that you make gluten free cooking accessible to people who want to have great food at a great price. Thanks for being you! Thank you so much for everything you said. You and I, we seem to speak each other’s unspoken language. :) This issue, the very one you described, has, at times, derailed me from keeping up with the blog regularly. I think reading other food blogs has spooked me, made me afraid that I was going to begin gazing at my own navel, wondering how it got so very lovely, and not focusing on the readers. Thank you for the encouragement, Angie! I’m a gluten free “mommy blogger”, and I do follow the cute names rule, i.e. Hubby for the husband, and try to add great pics. But I am anti-tweeting. As a busy mommy who barely has time to blog, I find tweeting a big time waster. And I feel, do people really need to know I’m sitting in the carpool line and had a great thought? Or that I just bought a caramel latter, yum? I don’t think so. The caramel latte thing is the very navel-gazing that I drives me crazy! Glad to hear we’re on the same page with that. I recently moved to a GF lifestyle and so glad I’ve done so. I love to read your blog and do aspire to use your recipes when I can find a few minutes to rub together. Very busy with custom quilts and really digging veggies, meat and dairy. I buy GF bread, but its so expensive I have to ration it off in each week. I love your site, read quite a few different older posts, so I’m reading and learning, Thanks so much!! I’m glad you’re going through the older posts. Enjoy! I just love your emails and blog! Don’t ever change. Thank you for giving the world great recipes! Well, you’re welcome! Thank you for posting, and for the kind words. If I change, I don’t want it to be because someone else told me in a one-size-fits-all sort of way that I had to change. I’m not a real lemon kind of girl but these sound like something I’d be willing to try ;) I liked your entry today…I want you to be real! Life isn’t always rainbows and butterflies…. To answer your questions: I have blogged about children’s lit and wanting to write it. In the past, I would ask people for words to use, and then create a 4-5 word story around that word. It was a good way to keep my brain busy in the short-term while working on longer projects. I have indeed come to the end of my dessert exile, which is a happy thing, because I’ve got a wedding to attend next week. I really like cake (though I’d rather have no cake than mediocre cake). It’s possible that I will make gf cupcakes for all of the wheat-free folks– I must remember to pack my GF on a Shoestring cookbook! In the meantime, I’ve turned my mom onto aebelskivers. We had them on Monday with 5 different kinds of jam. The self-cleaning property of lemon is reason enough to love it. I thought so (about children’s lit)! I’m so glad your dessert moratorium has ended. I think you should make GF cupcakes for everyone – and just not tell them that they are GF. How great, that your mom is making aebelskivers. I keep my pan and tongs out on my kitchen range, since they’re so pretty. Oh, Pam. I’m too busy sitting with my lemony tartness to turn that frown upside down. Oh no! I can understand not wanting to buy flour, though, just to have to move it. That’s crazy. You’re caught between a rock and a gluten-free hard place! Can you get your hands on even a box of something smaller at a grocery store – like King Arthur multi-purpose GF flour? If we were neighbors, I’d make you some lime bars. Have an uneventful move. I’ve not been posting here much lately because my husband was gone for 2 mos for work and got home a couple weeks ago so I’ve been cooking out of my freezer that I stashed while he was gone. Thanks for helping me fill my freezer! :) It’s nice to be back here, though. I love reading people’s comments and seeing the gf community support each other. No explanations necessary! I just thought it might be nice to know that you were missed. Or it might be creepy. You know, either way. :) It’s nice to have you back, Sarah. Dear Nicole, You break the rules, you flaunt the conventions, and yet we return, again and again. You must be doing something right. Oh yeah, you’re COOKING and BAKING, and then writing about your adventures! That’s three things you’re doing right. So, yay Nicole! I had a heyday of blogging where I was active in the children’s and teen/young adult blogosphere. It was fun, and I made friends, but after awhile, I realized, “Hey, this is not a paid gig.” I have an Etsy store, too (Alkelda [dot] com, in case you want to head on over and play with little felt dolls), and tried to follow some of the rules before realizing that there was only so much energy I was willing/able to commit. I have an active Facebook page, excellent customer service, photos that are better than they were before, and a team of fellow artisans. Twitter just isn’t happening for me. But lemon bars could happen for me. Rather, I could make them for other people and revel in my baking endeavors. I’ve decided that the lemon is my favorite fruit for its sheer versatility. Lemon provides contrast. Lemons are the stripes to my solids, the harmonic minor seconds to my major scales, the zigs to my zags. When life hands you lemons, make limoncello. But lemon bars will do nicely. 1. Your one picture is plenty and tons of pictures make it hard to find the text. 2. You are original and witty, you have a great writing voice, even when you are crabby! 3. Tweeting? Really? No thanks! 4. Nicknames can be cute, but they can also be annoying. 5. I comment on your blog, I hope I am witty and original, but I don’t really care. Mostly, I just want to tell you how great your blog is, and ask my questions, so my pictures (which I don’t take or post) look as lovely as yours! 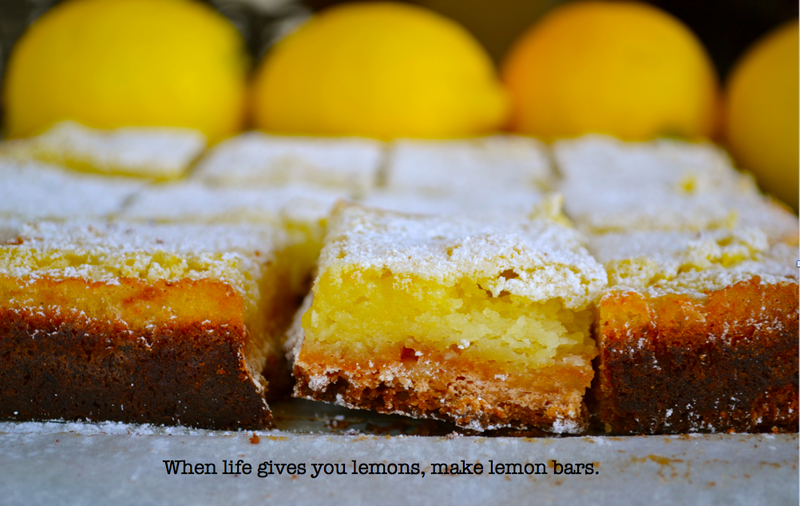 I love all things lemon, and since I was in a bit of a baking rut today lemon bars were the perfect thing to post. No one sells a gf all purpose flour mix in my area except in little teeny bags that definitely do not qualify as on a shoestring. Unfortunately Better Batter does not deliver to Canada. Do you have a favourite blend that you made before discovering Better Batter? If not, would you be able to tell me how much approximately one cup Better Batter weighs and I will see if I can match it up to a blend recipe. Thank you so much. About GF flour – I hear you about the teeny little bags. Better Batter is not a good value in small 20 ounce boxes sold in brick-and-mortar stores. It’s a great value online, though, especially when you buy the really big bags. That’s what I do. Before I used Better Batter, I used a stinky bean blend and was very sad but thought that that was the best I could do. It was actually a blog reader who suggested Better Batter, I ordered it and never looked back. I can tell you that Better Batter all-purpose gluten-free flour weighs, on average, 165 grams per cup. I hope that helps! Thank you for helping out, Kadren! I’m so glad you found such success, and can share it with Martine! Kadren! :) That’s my flour blend! :) Thanks for posting it!! It’s been a life saver for us since there aren’t any non-bean non-rice GF flour blends out there. :) I’m glad it’s working out well for you. I LOVE your blog- style! Yours is the only blog I read! I like it real, I like the little white dog. My pug/Chihuahua mix chases the cursor on screen and licks it wherever it goes! She’s pretty much a *itch, dominant over the dog 30lbs. Bigger than her. Keep up the great work! When life hands me lemons i either just cut them and eat them or I make lemon curd. Lemon bars sound oh so divine and I think I’ll do that with our next batch! I do have a blog but its not a food blog though often times I find myself talking about food a lot either in recipe or in preserving food. My blog tracks our progress as a family on our urban farm, though do to being thrown lemons, that will change big time but i’m keeping the blog for us & family. The blogs I read tend to be around the same tone of either food or urban farming/homesteading. I didn’t know that you had an urban farm. That’s pret-ty cool. Did you ever read the book “Farm City” by Novella Carpenter? It’s a great memoir of her urban farm in the mean streets of Oakland, California? It’s such a great book. I would have left it all behind (all – all what?) to move next door to her when I was reading that book! That’s really nice that you keep your blog for yours and your family’s posterity. I don’t often think of this blog as serving that purpose, but I guess my kids can look back on it and remember, when they are all growns up one day. I can’t remember which 2 blogs I suggested to you! Was it gingerlemongirl and another? Remind me! I get what you mean about not enjoying being told what to do when you feel you already know. The thing is, the bloggers who are usually doing the telling-what-to-do are the ones who have been doing this much longer than I have. And then other bloggers mimic what those bloggers say, and it becomes almost cult-like. It can be hard to stand your ground, when you’re not entirely sure if yours is solid, you know? But thank you for the vote of confidence! Sounds like your kitchen has been humming, as usual. Keep up the good work! If you post Great Recipes YES I will Visit! I try to blog & do have and empty Etsy store….I wish the “internet” would make me money while I work (30hrs), clean the house, laundry, cook meals, manage the kids & hubby…..*sigh! I think I am cranky too! ps The GF community is unique, I think we are truly supportive! Can you hear an echo in your empty Etsy store? Good thing there’s no overhead!